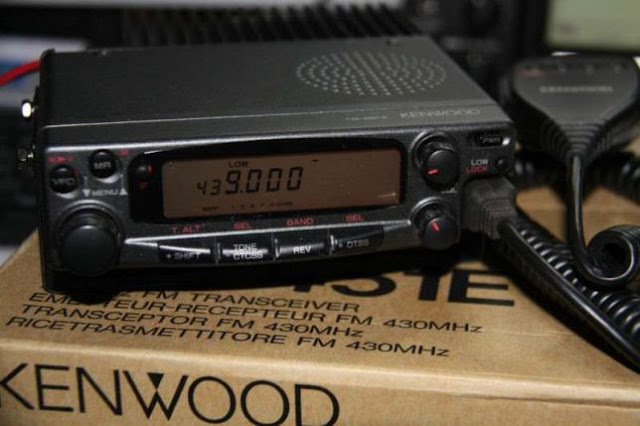 ↱ Kenwood TM-451A/E series include dual band receive capability. The TM-251A and TM-451A can switch between 144 MHz and 440 MHz on receive. They also feature packet compatibility for 1200 or 9600 bps accessible from the rear panel. ↳ There are 40 memory channels plus 1 call channel, and all can be used to store transmit and receive frequencies as well as repeater and signaling data. The built-in digital recording system enables automatic storing of a signal picked up by the radio for later playback (for two 8 second messages). The TM-451A/E transmits on 2 meters with three output power levels: 5/10/50 watts. Supplied with MC-45DM DTMF hand mic. ↳ The Kenwood TM-451A transmits on 440 MHz with three output power levels: 5/10/35 watts. The Kenwood TM-551A dual band receives on 440 and 1200 and transmits on 1200 MHz with 10 watts.